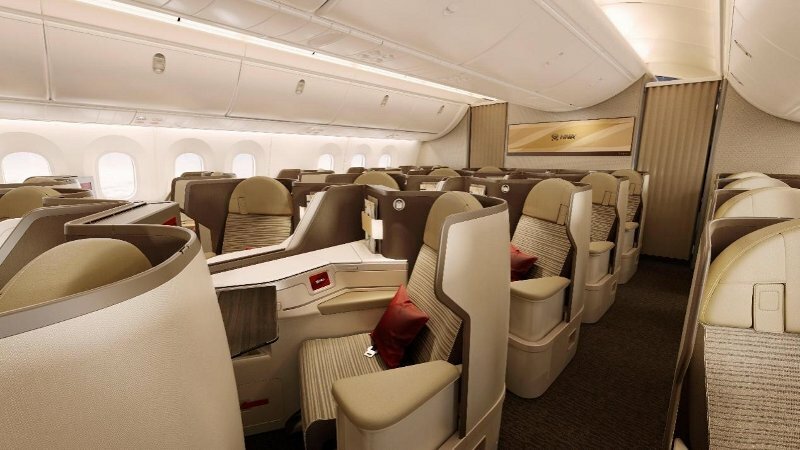 Hainan Airlines 787-9 Dreamliner's Business Class with 'Dream Feather' interiors. Credit: PRNewsfoto/Hainan Airlines Co., Ltd.
China’s Hainan Airlines has taken delivery of its first 787-9 Dreamliner aircraft featuring ‘Dream Feather’ interiors at Haikou Meilan International Airport. The ‘Dream Feather’ concept is intended to provide passengers with a ‘better than the expected five-star flight experience’. The company teamed up with UK-based PriestmanGoode to create the concept. According to the company, the project was completed in under two years. The concept involved enhancing the airline’s cabin environment, air-to-ground service supplies, service logos and ground premium VIP check-in areas. In a statement, Hainan Airlines said: “The Dream Feather concept is based on the idea that a feather in a dream is often presented as a feather that is floating in the air or a ‘feather in flight’. The new 787-9 Dreamliner with the Dream Feather design will serve domestic routes from Beijing to Haikou, Sanya, Chengdu, Changsha, Guiyang, Fuzhou, Xiamen and other cities. The aircraft will also serve international routes between Beijing and destinations in North America. The company has added the new Super Economy class to its already existing two classes. With the introduction of the third class, a total of 294 seats comprising 26 business class seats, 21 super economy class seats and 247 economy class seats are now available. The company also noted that the Dream Feather design offers its passengers with features for easy smart travel.